Terry Nelson (UK Entrepreneur) explains how Real Madrid F.C signed him up! Today my guest is an inspirational businessman. Terry Nelson. Terry is the founder & driving force behind TNAR – Terry Nelson’s Aqua Running. Terry is the creator of the patented “Elite Hydro Buoyancy Training System” a revolutionary buoyancy training suit which allows its users to remain completely upright in water, permitting them to perform a complete range of exercises in water, including running. Terry’s customers include globally famous names such as 10 times European Champions Real Madrid & leading English clubs including Liverpool & Manchester United. 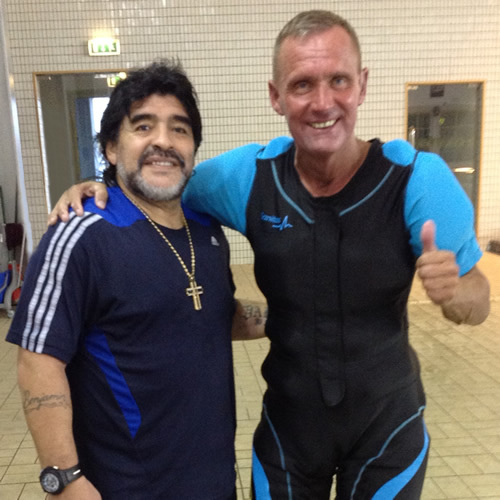 He also counts the England Rugby & British Lions teams amongst his customers as well as stars such as Diego Maradona. But Terry’s route to business success has not been straightforward. Diagnosed with a serious kidney condition in his early twenties, Terry has had to overcome kidney transplants & as a result of this one of his legs was amputated several years ago. A committed athlete, Terry has not allowed his condition to affect his love of sport & he can count amongst his achievements being crowned the 5,000 metre transplant world champion, an event that he won just 5 weeks after a serious foot injury. Terry is also an ambassador for the government’s Disability Confident campaign, which aims to boost the employment rate amongst disabled people & in fact his UK manufacturing facility only employs disabled staff so Terry is not frightened to practice what he preaches. To be honest, the word “inspirational” can be somewhat overused, but in Terry’s case, it is an understatement. A more appropriate way to describe Terry is “Phenomenon”. Enjoy our interview & as always, your comments are most welcome below. If you have any questions please comment here and we will get back to you.